With the right DIY spirit and a little guidance, there’s no reason why you cannot achieve great disc duplication results yourself. How do you know if in-house/home use duplication is for you? Check out our hand guide! In-house duplication is a great fit for a variety of businesses, usually ones that require smaller but frequent runs of optical media. Remember that duplication equipment is an investment and there are affordable options on the market for printers, duplicators, packaging devices, and combination machines. a printer to print the disc labels (if needed). You will also need to purchase blank writable discs which you can do here. 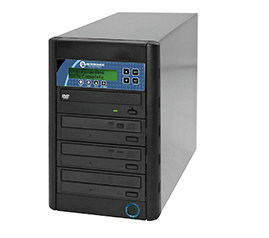 Keep in mind for stand-alone duplicator towers, the original media format in the reader drive must match what’s in the burner drives: a CD will solely copy to other CDs and a DVD will only record onto other DVDs. Additionally, duplicators are either manual or automated. Manual duplicators contain one reading drive and multiple burner drives as well as a straightforward button menu. Just power the duplicator and load the trays. Manual duplicators require a person to load and unload the trays by hand. An automated duplicator does this for you, usually using a robotic arm which deposits completed discs in an output bin for collection. Either type will utilize user friendly, easy to understand software or interface for operation. There are a wide variety of duplicators on the market that are suited to your quantity needs. There are 1 to 1 duplicator towers that are easy to use and affordable for customers who only need occasional duplication with a very small amount of discs. As mentioned before, most computers have burning capabilities (it’s quite often standard) but you’ll need to make sure you have the software to make it function. You want software that supports features that will match what content you want. For example, if you’re working with audio and movie for DVDs, make sure your computer can handle burning DVDs. Proper software will also make creating and manipulating content on your disc even easier. A majority of the latest DVD and Blu-ray drives are backwards compatible, meaning they’ll play (read) or record older generation disc formats like the CD. However, the reverse is not true; there’s no “forward” compatibility; a CD drive wont’ write DVDs or Blu-rays, for example. A disc duplicator gives you print options to customize the surface of your discs using a printer that can directly print art onto its surface. Or you can use a printer with the capability to print adhesive disc labels. A direct CD/DVD printer can often perform multiple tasks so that you can get more for your investment. For example, there are inkjet printer models that not only print on discs but can function without a computer by accessing camera or other memory cards. They can scan documents, correct photos, and print from wireless devices. Many standard inkjet or laser printers can accommodate adhesive CD and DVD labels. Just make sure that the label paper you choose matches the ink and printer type you will use. Also check to make sure the paper dimensions will be compatible. Microsoft Word or any other word processing program should have layout options. Most importantly, before you begin at-home/in-house duplication, you should be aware of regulations that directly affect producing disc copies: copyright law. These federal rules are in place to protect the value and integrity of another individual’s creative work, which includes but is not limited to music, film, and other recordings. It is a violation of civil and criminal laws to duplicate or distribute other creative work without authorized permission. You might even violate copyright law without even knowing it—burning copies of downloaded music for family and friends can sometimes fall under copyright infringement. Simply grabbing select material from a purchased disc and distributing it among those you know may also be against the law. You are allowed under no circumstances to personally profit from protected original work on copied discs. In some cases, you can download music from sites authorized by the copyright holder and burn it for non-commercial use. However, these instances are limited to “fair use” which can be tricky to navigate because every extenuating circumstance is slightly different. Fair use is a doctrine of copyright law that outlines how reproduced copies can be used. Disc copies of original work can be used in reporting, teaching, or research. Other fair use considerations include (if it’s for commercial use): the nature of the protected work, how it’s being used and what impact the use of the work will have on its future commercial value. Some blank media is already formatted for copyright protection, as it won’t function along with certain recorded disc formats. 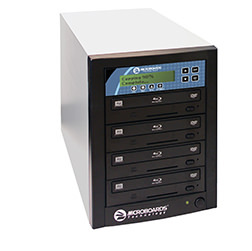 Many standalone duplicator towers won’t write copyrighted or protected discs, and your original master disc for the reading tray must also be non-copy protected.